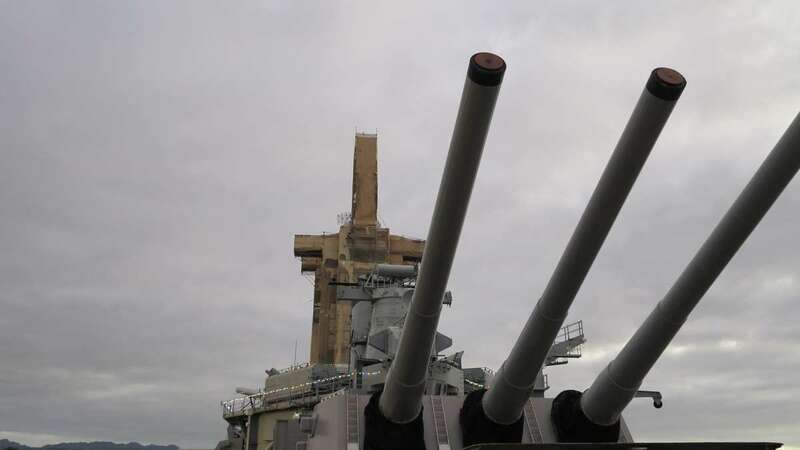 Battleship Missouri Memorial. Image: David Foley / ANMM. In 1945 the Japanese Instrument of Surrender was signed aboard the USS Missouri, which signalled the end of hostilities between Japan and the Allied forces. As part of the War and Peace in the Pacific 75 Education Program, we invited schools from the USA, Japan and Australia to investigate the impact of WWII on their community and make documentary videos of what they found. 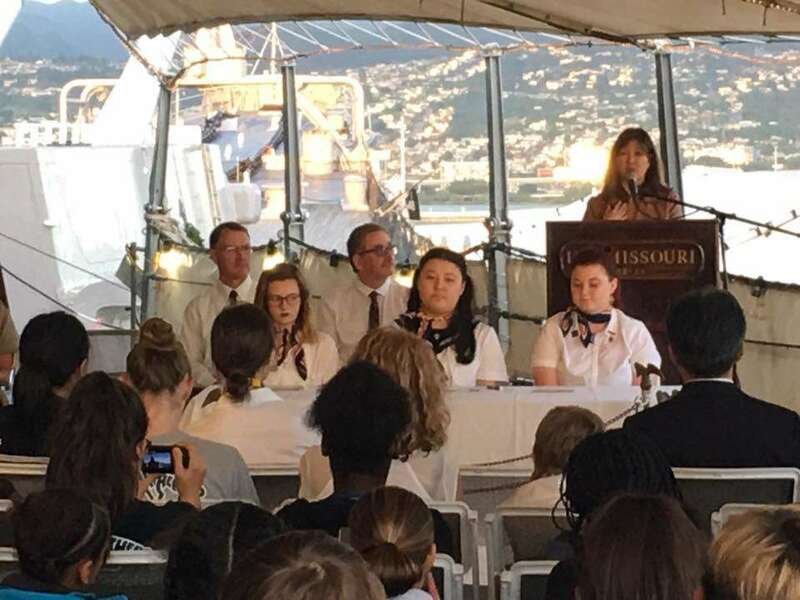 As a climax to this program, student ambassadors from one school in each county attended a Friendship Ceremony on board the USS Missouri to mark the 76th anniversary of the bombing of Pearl Harbour. 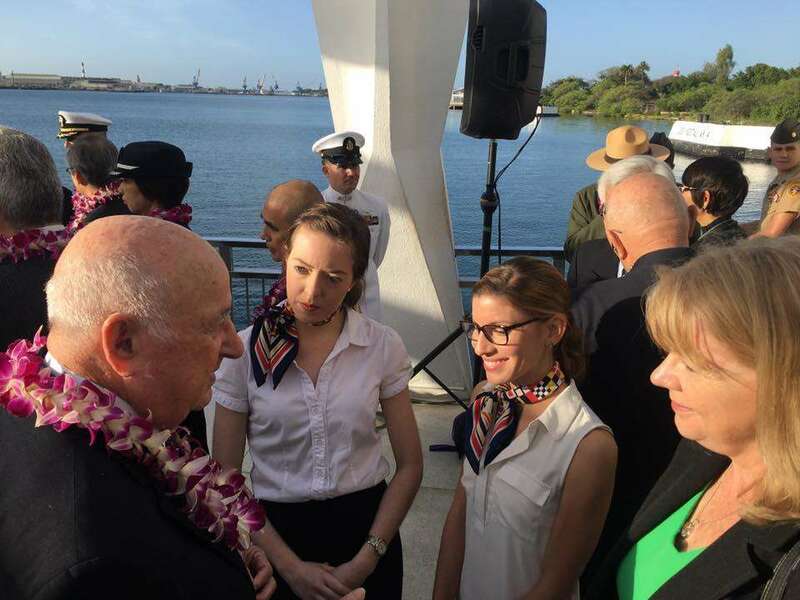 The student ambassadors each gave a speech on their commitment to maintain and promote peace in the Pacific. They also signed a friendship agreement between Australia, the USA and Japan. As I sit here thinking about whether I can write a blog that does last week justice – the students, the teachers and the other participating museums and schools we visited – I can only describe it as an incredible life-changing moment for everyone. 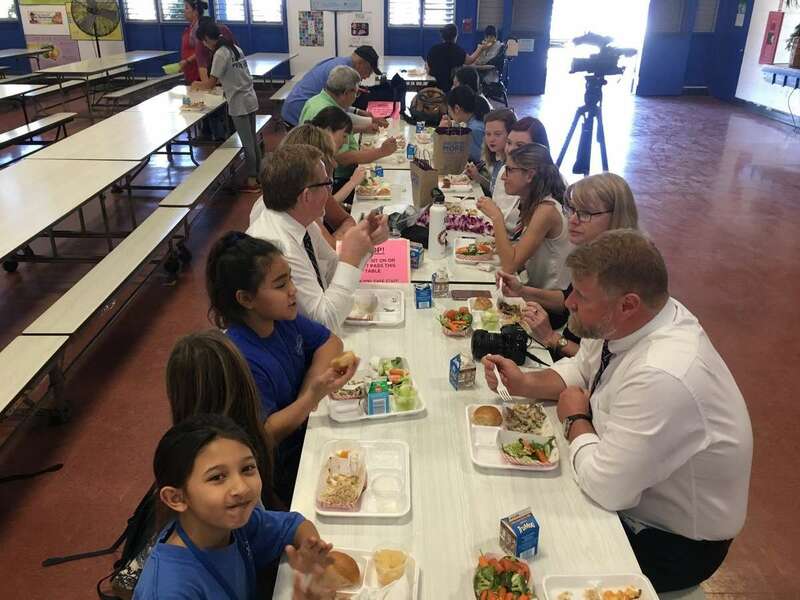 When my colleagues Jeff Fletcher, Senior Education Officer, David Foley, Dart Connections, and I started to plan for three students to come together in Hawaii we all thought it would be special. However, we didn’t realise that it would have a profound effect on the entire group. We left the week with a jumble of emotions, ranging from pride and awe, to dismay at the futility of war, and settling somewhere around a sense of hope which the now close alliance between the USA, Australia and Japan brings. 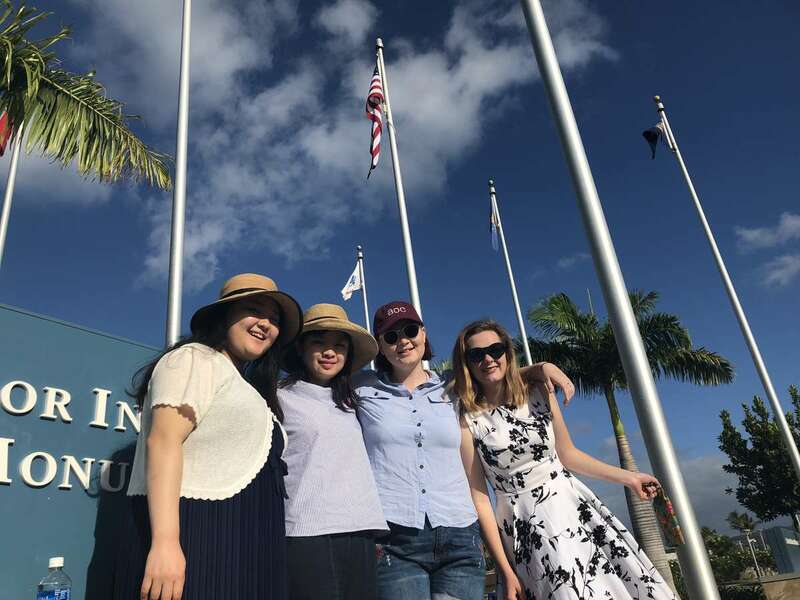 Student ambassadors outside the World War II Valor in the Pacific National Monument, Pearl Harbor. From left: Nanari Minegishi, Millicent Sarginson and Sara Cole. Image: Anne Doran / ANMM. 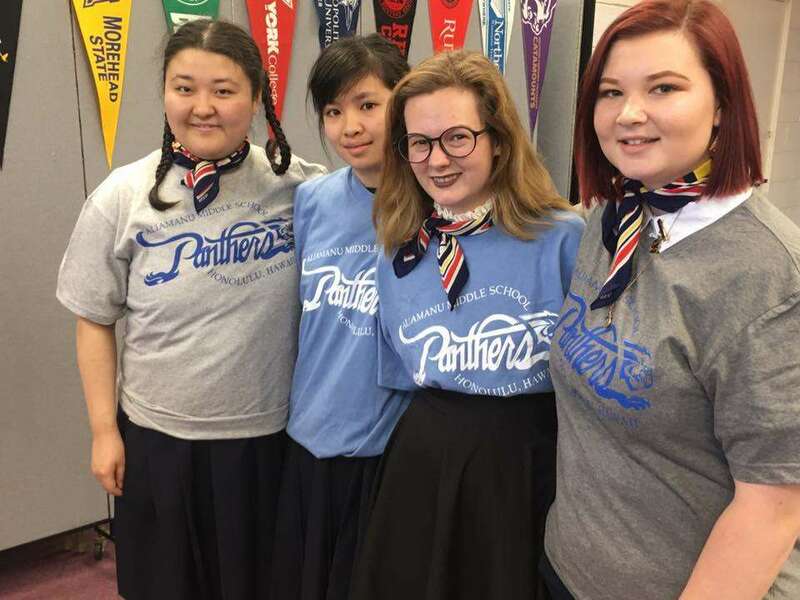 We met the students and teachers through a video conference before we travelled, but what we didn’t know was that the three girls had already been messaging each other after the conference, so when they got into the minibus together there was no awkwardness – just excited chatter. Our week began with a visit to the World War II Valor in the Pacific National Monument. Here we met Mr Jimmy Lee, who witnessed the bombing of Pearl Harbor when he was 11 years old. Jimmy shared many insights about his experience of World War II with our student ambassadors but the most poignant moment was when he described his loss of innocence: He began by saying that he thought the bombing was an amazing show, but after the bombardment, he realised the small boats moving around the harbor were, in fact, picking up bodies not debris (as he had originally thought). Jimmy still pictures this life-defining moment as clearly as if it was yesterday. It is hard not to come away from Jimmy’s talk without a greater understanding of the very personal experiences connected to war. 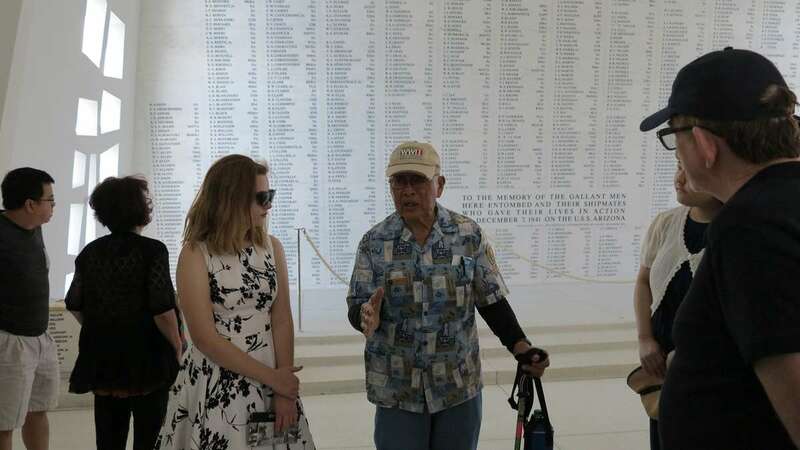 Sara and Jimmy Lee at the Arizona Memorial. Image: Anne Doran / ANMM. 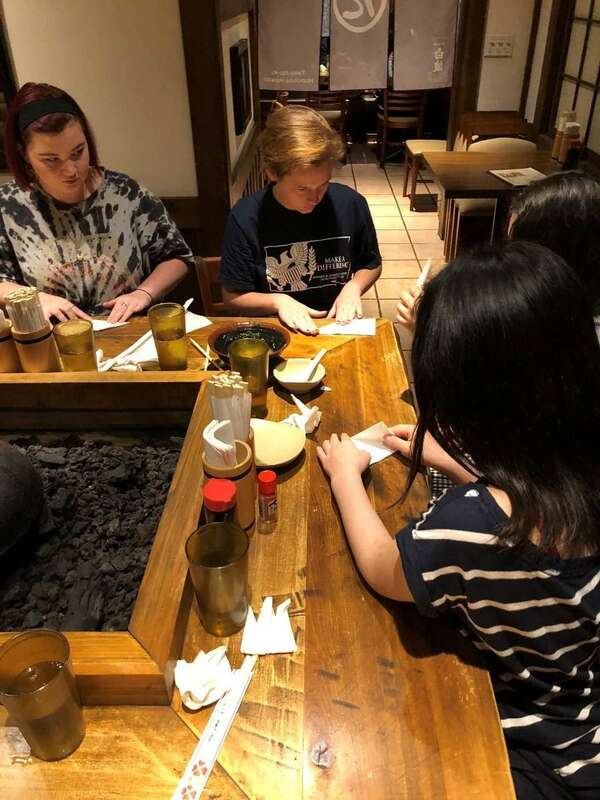 That evening we went to a traditional Japanese restaurant and the Japanese students helped guide our dinner selections and taught Millie and Sara how to create paper cranes. The group making paper cranes at dinner. Image: Jeff Fletcher / ANMM. 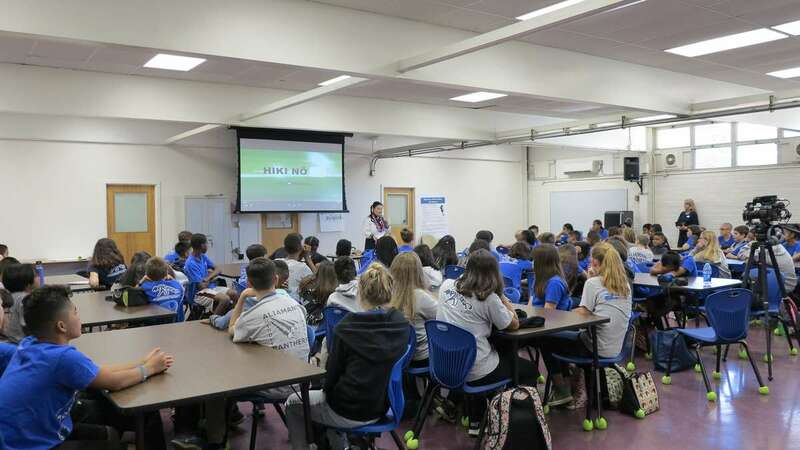 We visited Aliamanu Middle School and our ambassadors spoke to 120 Year 7 students. After a traditional Hawaiian welcome, our three very nervous young women changed into three poised confident and engaging speakers. 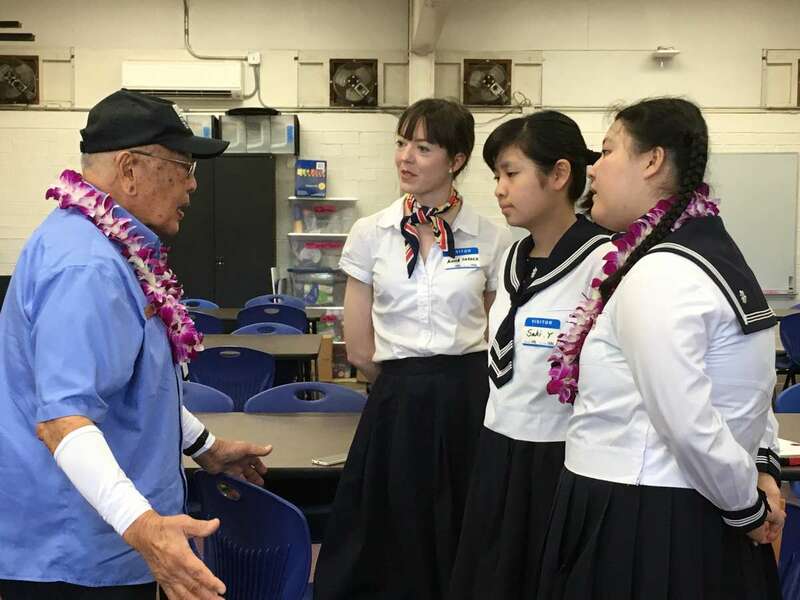 Mr Jimmy Lee also spoke to these students and told of his missing best friend who disappeared after the bombing raids…and who was also Japanese. He searched for over 70 years only to discover that his friend had survived the raid but the family changed their names and sadly, the childhood friend had only recently died. To all the students, he stressed the futility of hate and wars. Jimmy praised the initiative to bring together youth, in the name of friendship, to promote peace. 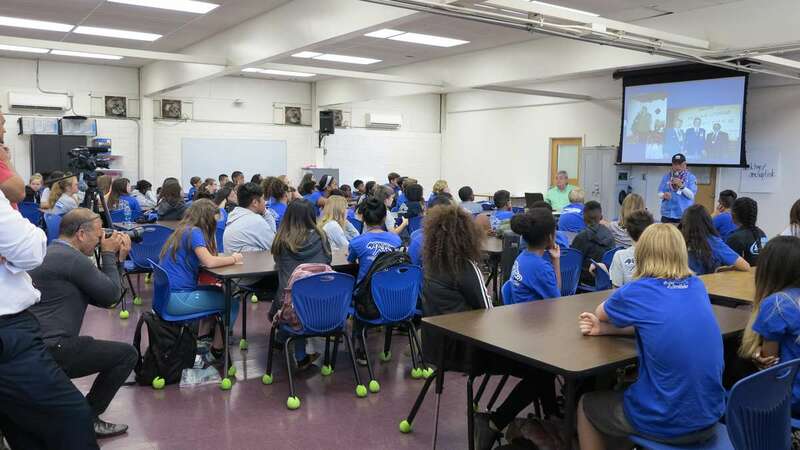 Talking to the Students at Aliamanu Middle School. Image: ANMM. The group with their new Aliamanu Middle school shirts. Image: ANMM. Lunch at the school. Image: ANMM. 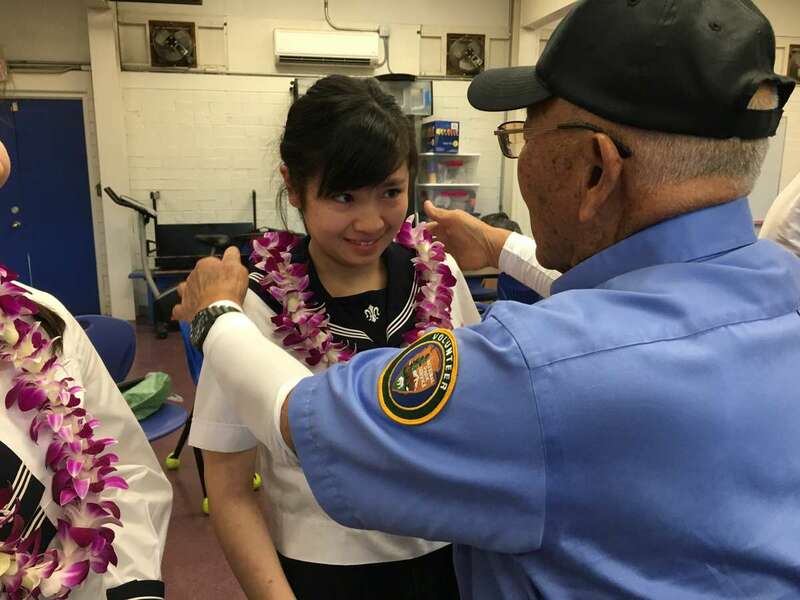 Jimmy Lee presenting Saki with a welcoming lei. Image: ANMM. Jimmy Lee with the Anna Parker, Saki and Nanari at Aliamanu Middle School. Image: David Foley / ANMM. After years of watching American movies with scenes featuring lunch rooms, we got to eat lunch in a school cafeteria. We were quickly surrounded by students asking to hear our accents! From here we went to Waikiki beach where the students recorded their reflections on the trip thus far, watched the sunset, a Hula show and ate pizza. Later that night, Millie commented: ‘Despite our cultural differences, we are all the same really: young women finding our way. Similar worries, hopes and dreams. We all think about school grades, future careers, university, friends and family’. 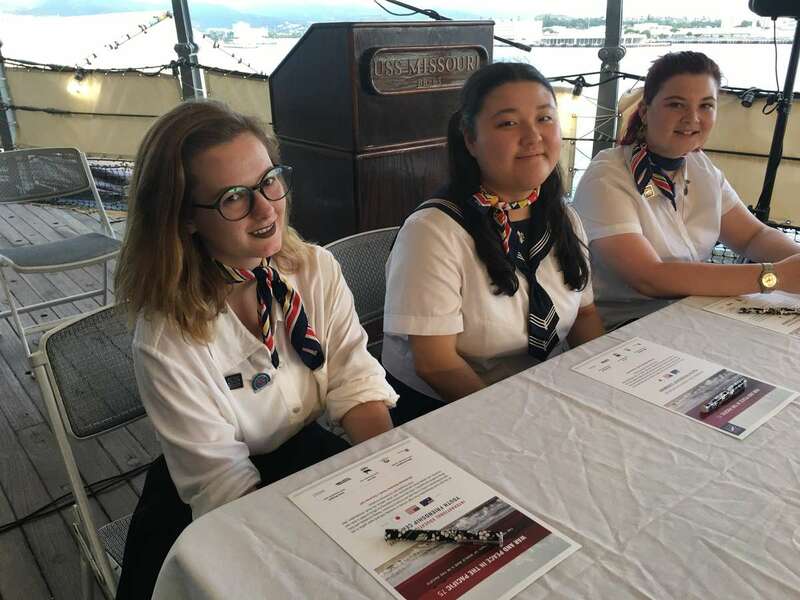 The staff at the Pacific Aviation Museum invited our group to attend the ceremony of the Blackened Canteen at dawn the next day, followed by a Youth Peace Symposium. 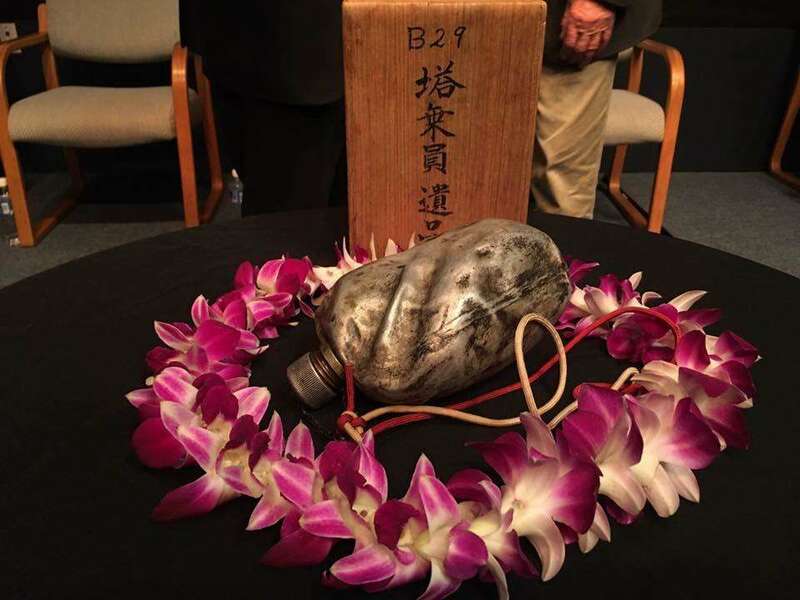 The ceremony is a celebration of a simple act of humanity and reconciliation and is centred around a single object: a canteen recovered from the mid-air collision of two American bombers over Shizuoka, Japan in 1945. It was incredibly moving and there was barely a dry eye for all those attending. Once again, the futility of war and how we must move towards friendship and peace were key themes. Former foes now friends at the Peace Summit. Image: David Foley / ANMM. The canteen at the Peace Summit. Image: David Foley / ANMM. The Blacken Canteen Ceremony. Image: David Foley / ANMM. Anna and Jessica at the Blackened Canteen Ceremony. Image: David Foley / ANMM. After the moving ceremony, we travelled to the Pacific Aviation Museum for a breakfast and the Youth Peace Symposium. At the breakfast I found myself sitting next to two gentlemen who were distinguished and decorated fighter pilots. These men had a chest full of medals, and yet, once again there was another moment when they praised the project for promoting peace through friendship among students. Both stressed the need for a kinder world, of forgiveness and friendship. 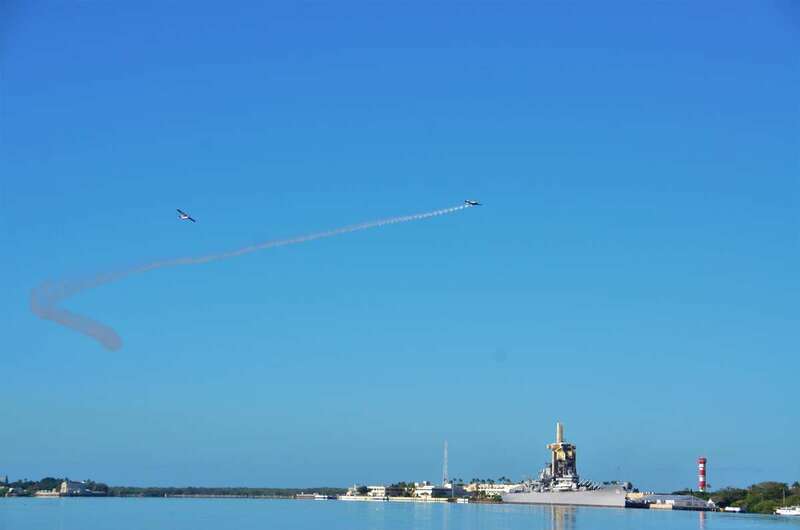 Fly over of vintage planes as part of the 76th bombing of Pearl Harbor anniversary commemorations. Image: Anne Doran / ANMM. That evening was Nanari’s 18th birthday, so a special celebration was held at dinner with a cake and it was clear to all that ambassadors had become true friends. 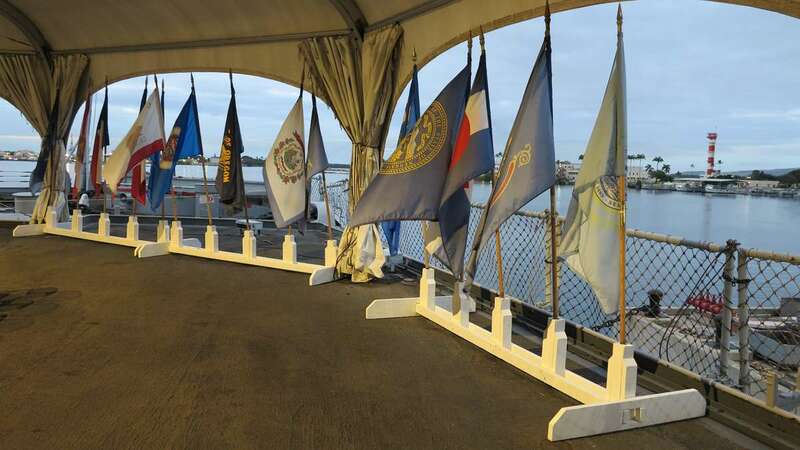 The following morning we travelled once more to the World War II Valor in the Pacific National Monument for the dawn ceremony commemorating the 76th anniversary of the bombing of Pearl Harbor. This ceremony was held on the lawn and was very moving. There was a large Japanese contingent and the religious blessing featured both a Buddhist and Anglican leader. The message was clear: The bombing happened, the war happened but humanity move must onwards to a peaceful future. Once again I came away with an overwhelming feeling of hope for future generations. From here we were joined by the students from the Aliamanu Middle School at the Pacific Aviation Museum for a special school program. Jessica and Sara had a moment when they were able to see one of the Douglas SBD Dauntless planes which were built in their local area during the war – a fact they only discovered during their research project. Now nerves were beginning to kick in for the group as the countdown was on to The Friendship Ceremony, the very reason we were in Hawaii. 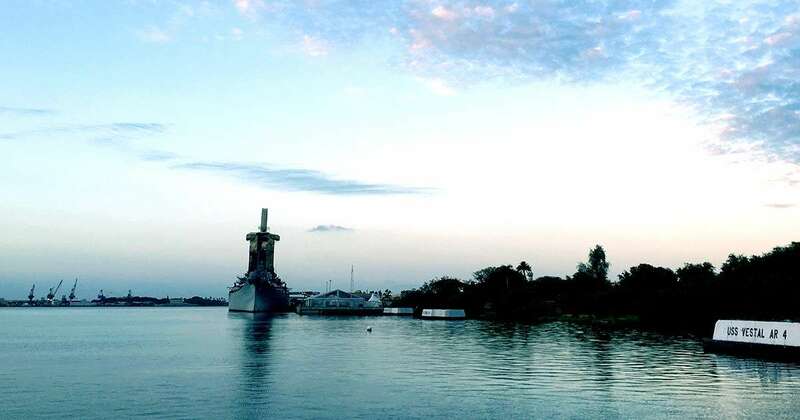 The USS Missouri, where the Friendship Ceremony was held on the 76th anniversary of the bombing of Pearl Harbor. Image: Anne Doran / ANMM. 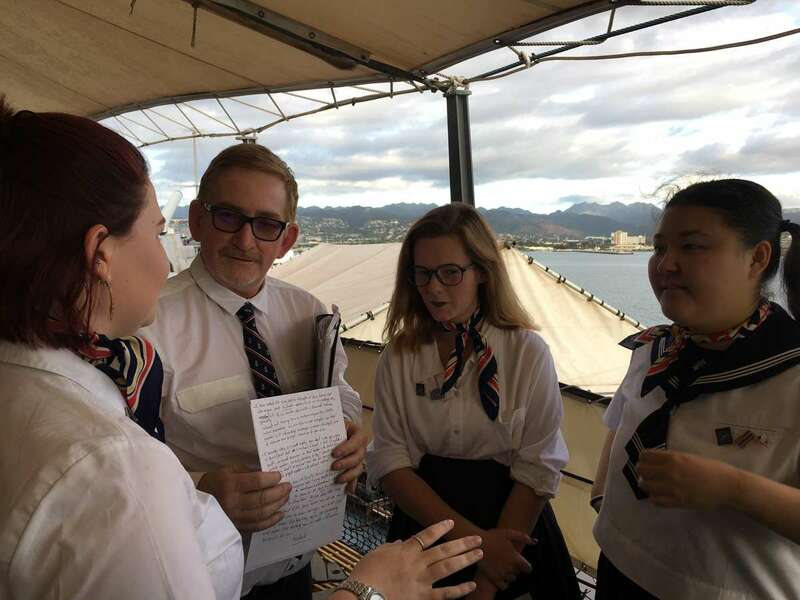 On the Surrender deck, our ambassadors were quietly re-reading their speeches and composing themselves, their teachers were also nervous, and suddenly for myself, Jeff and David, it all became very real. This was really happening. I cannot remember all the tiny details of the ceremony, but I do recall how wonderfully everyone spoke, the moving meaning and beliefs behind their words, the stillness of the evening and the beautiful colours of the sunset. It was my job to take photos, but I didn’t end up taking any photos as I was on tenterhooks until the ceremony was over and then I was filled with a mixture of pride, excitement and relief that it had all gone well. 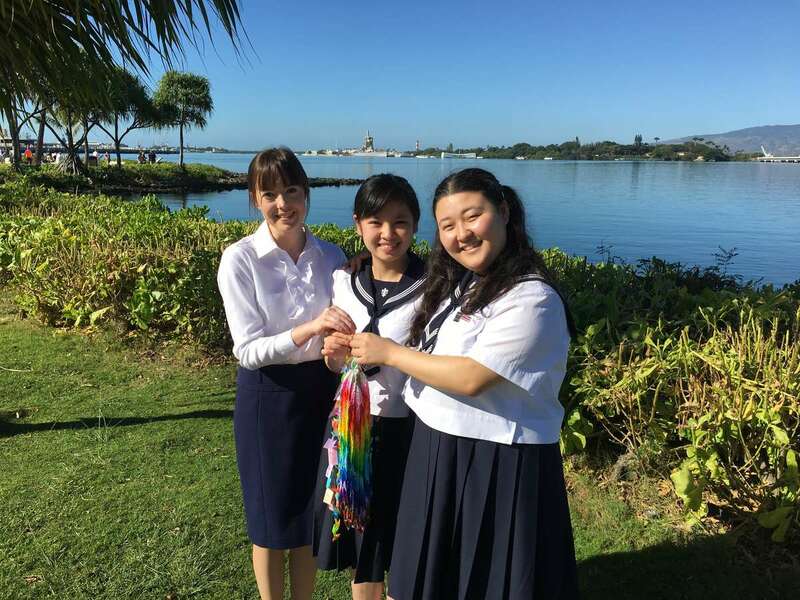 The Japanese students and teacher with the paper cranes they made to be presented to the Museum at the Friendship Ceremony. Image: David Foley / ANMM. Jeff with the ambassadors before the Friendship Ceremony. Image: David Foley / ANMM. Guest Speaker, author and filmmaker, Stacy Hayashi addresses the Ceremony. Image: David Foley / ANMM. Students and Special Guests watching the Friendship Ceremony. Image: David Foley / ANMM. Facing the stern of the USS Battleship Missouri Memorial. Image: Anne Doran / ANMM. 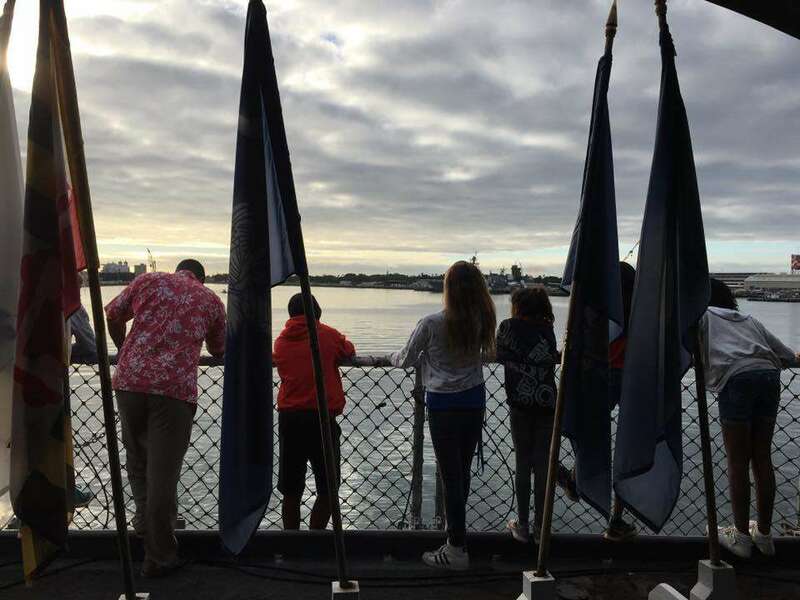 Some of the Aliamanu Middle School students on the Battleship Missouri Memorial. Image: Anne Doran / ANMM. 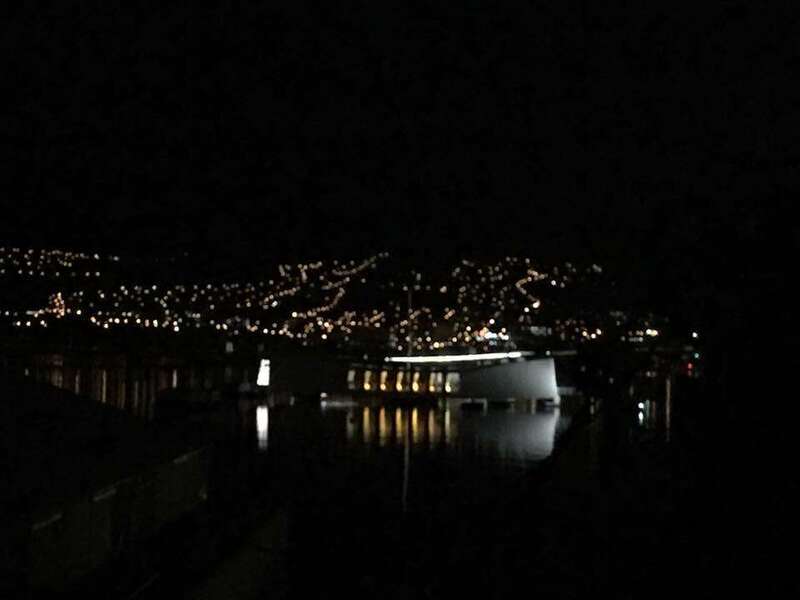 Arizona Memorial at night. Image: Anne Doran / ANMM. Facing towards the Bow of the Battleship Missouri Memorial. Image: Anne Doran / ANMM. Jeff’s moment came sitting on the speaker’s platform and just watching the girls conduct that ceremony, knowing that they are the true ambassadors for tomorrow and that they understood the importance of the past. 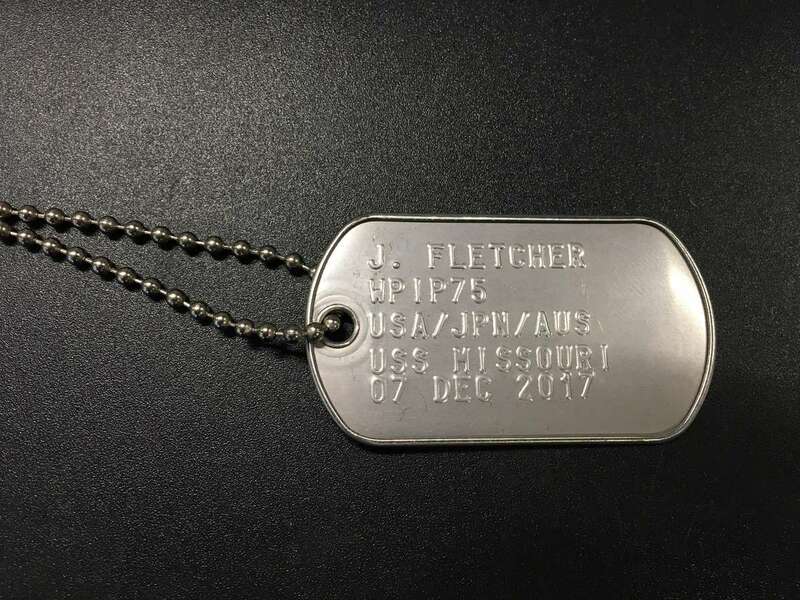 Jeff’s dog tag presented by the Learning team of the Battleship Missouri Memorial. Image: Jeff Fletcher / ANMM. 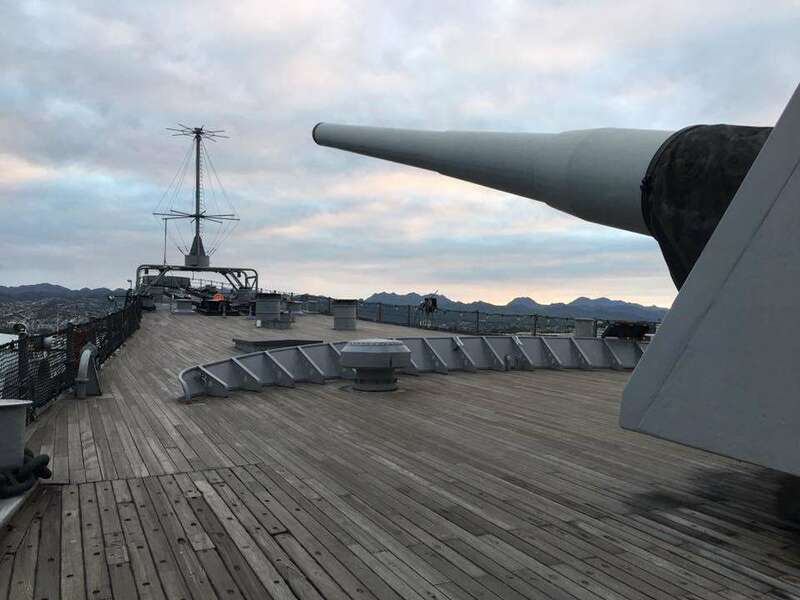 But that wasn’t the end of our fantastic visit to the Battleship Missouri Memorial: The Missouri Education team hosted a dinner, a tour and then we all slept over in the bunks built for and used by WWII sailors all those years ago. 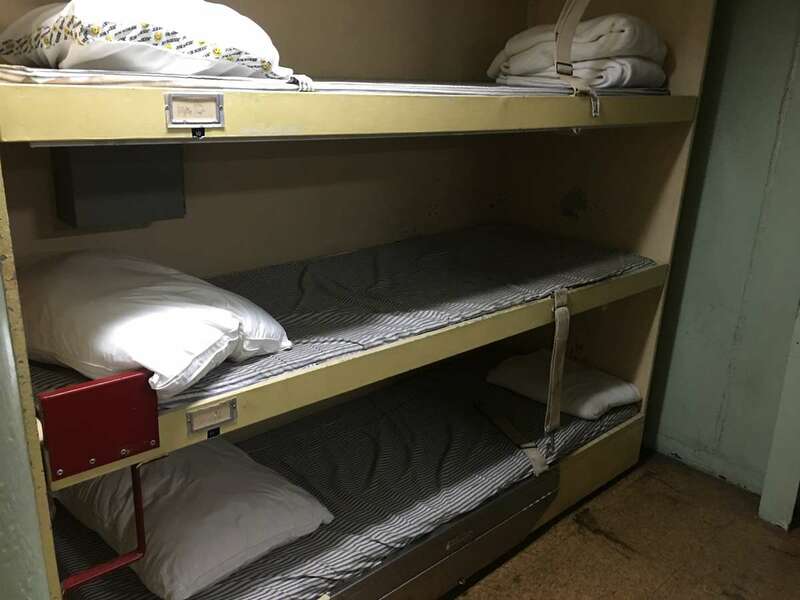 The bunks of the USS Missouri, where the team slept overnight after the Friendship Ceremony. Image: David Foley / ANMM. Now I’ve had the time to reflect on this experience, I can only have one word to describe it: WOW. The poise of our ambassadors, the connections between the Educators and the belief that we achieved something very special. Student ambassadors at the Friendship Ceremony. From left: Sara Cole, Nanari Minegishi and Millicent Sarginson. Image: David Foley / ANMM. Jessica Ruiz, Teacher, Academy of the Canyons Santa Clarita, California, USA. The project itself was enough of a hands-on learning experience to last a lifetime for the students: Conducting original research, telling a story just like a historian, implementing technical skills, writing a script and sifting through mounds of information. To do some authentic learning for an authentic purpose is, unfortunately, not the norm in education. Then again, if your museum hadn’t come looking for schools, we never would have had the opportunity. 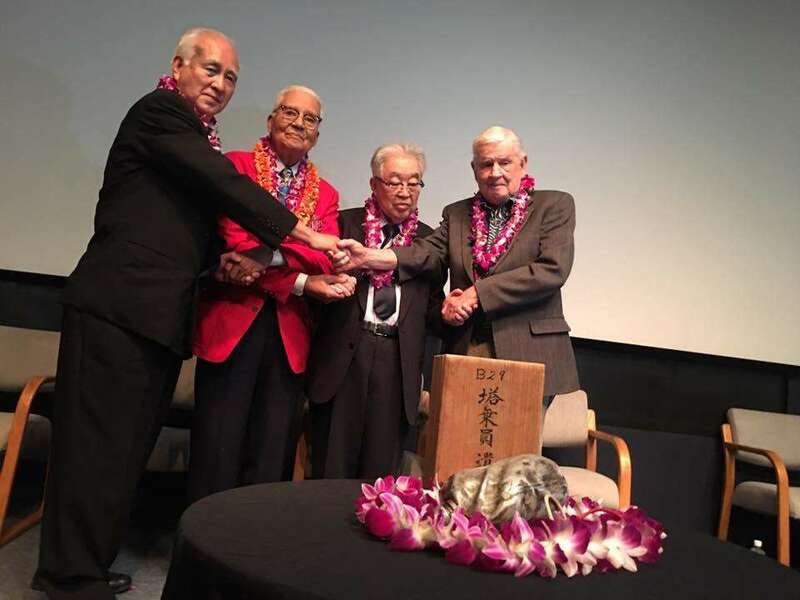 But the culminating moment of a Friendship Ceremony, way out in the middle of the Pacific, as strategic a centralized location now as it was in 1941, took the satisfaction I felt after my students completed their documentary and expanded it to new heights! I expected Sara to get a lot out of the experience. I didn’t expect to come home feeling like that experience would be a hinge for my own life. I am now more certain than ever that real-world learning experiences are a necessity, not a luxury for our students. I was surprised at the connection I felt to students and adults who had lives and experiences that mirrored mine on the other side of the globe. What could our students learn from people that they can never get from a textbook or essay or ordinary project? 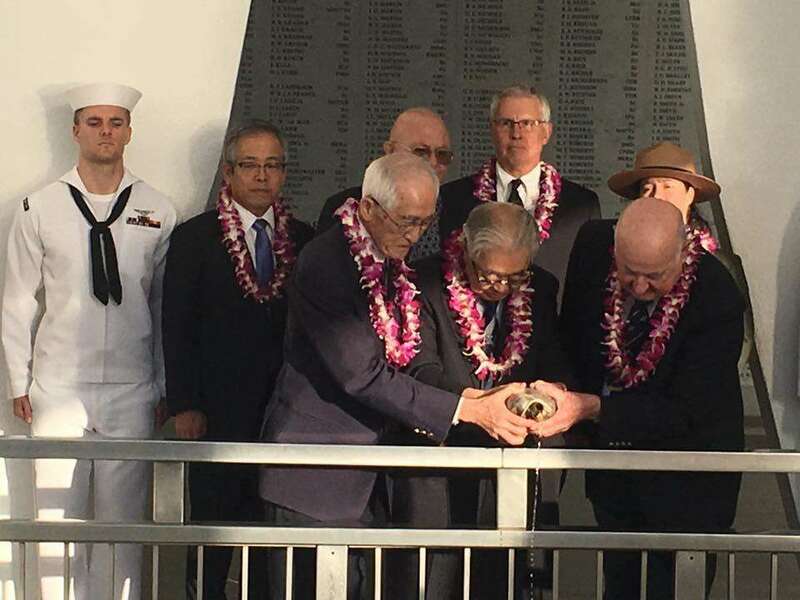 The Ceremony itself, at the end of a whirlwind of a week getting to know one another as we learned more about Pearl Harbor, WWII, and its tragic ripple effects on all sides, wasn’t a contrived ceremony where the word ‘friendship’ was symbolic. By Thursday evening, the friendships were real and it was the ceremony that was contrived for everyone else to see. Talk about authentic learning! To see our three ambassadors take the stage alongside people whose job it is to educate and preserve peace reminded me that it is the project of all of humanity, the most authentic project of all, to intentionally learn from the past and pursue peace. Anna Parker, Teacher, Sendai Shirayuri Gakuen Senior High School, Japan. My students and I learnt so much about our countries – Japan, Australia, and the United States – their histories, and philosophies. I was very proud to be able to represent Japan and I’m even prouder of what my students achieved during the War and Peace in the Pacific 75 Education program. I am very grateful to the museum and all involved for their visionary idea and making everything come together. Brendan Maher, Principal, Lake Macquarie High School, Australia. 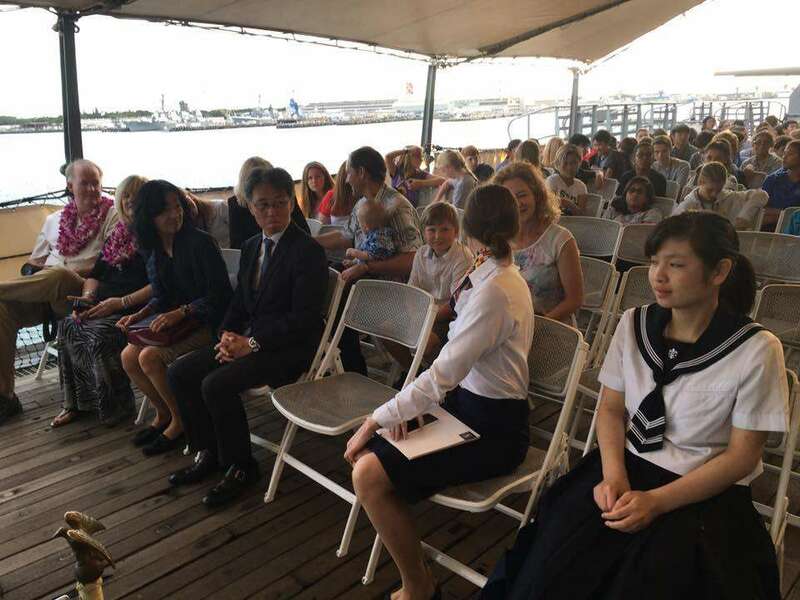 As the Principal of Lake Macquarie High School I was immensely proud of our involvement in this year’s War and Peace in the Pacific 75 Project developed and delivered by educational staff at the Australian National Maritime Museum. Our school had seven Year 10 students involved in the development of a documentary highlighting the effects of World War II on our local community. The growth of the students’ confidence and skills as researchers was dramatic and the product was a documentary that the entire school was proud of. I was interested in the project as it met the requirement for the schools to be involved in a STEM based project. The project moved beyond the usual use of textbooks and made the students the leaders of their own learning. The staff at the Museum provided a high degree of support to the school and made the project a successful proof of concept for further student-centred STEM based projects. The culmination of the project was a highlight for myself as an educator and for Millie Sarginson, our Australian ambassador who was successful in her application to attend. I was confident it would be a success, on reflection, it was so much more than I envisaged. The week allowed for staff and students to be immersed in the environment of the historical events and their impact on local and global history. 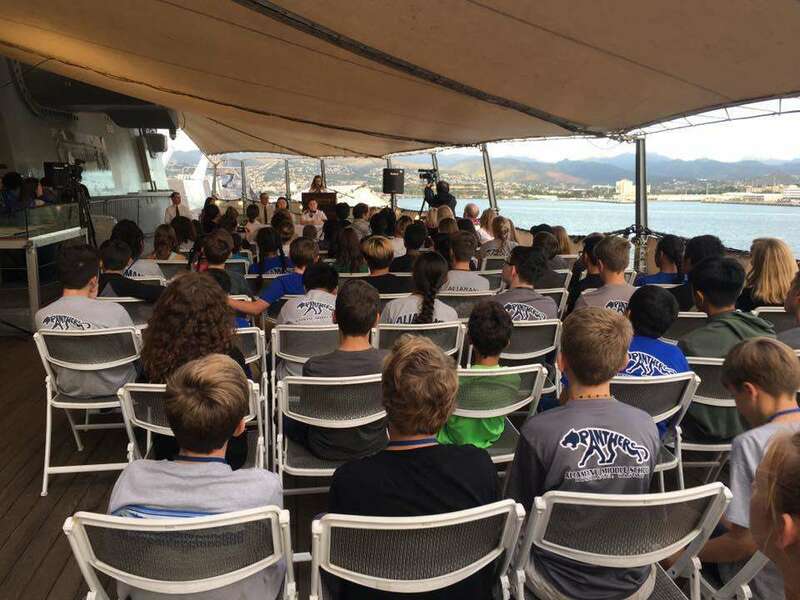 Students were fortunate to speak with real people who were involved in Pearl Harbour, from all sides of the conflict. The power of such an opportunity took learning beyond the textbook to allow students in interact with the real content. This project also highlighted the capacity of the Museum to provide Project Based Learning aspects to support schools across all year levels. By allowing students to access real historical data, coupled with the expert museum education team, the scope of future projects is exciting. I commend the Australian National Maritime Museum for this great learning opportunity and I would not hesitate to be involved in future projects. War and Peace in the Pacific 75 – part of the museum’s USA programs that commemorate significant 75th anniversaries of World War II, supported by the USA Bicentennial Gift Fund. Image: ANMM.